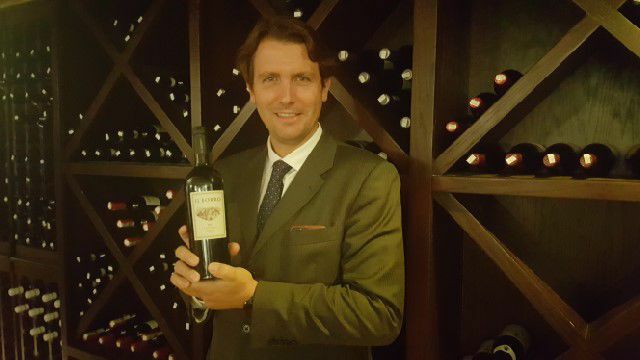 Salvatore Ferragamo, the grandson of the famous Italian shoe designer, was in Los Angeles to promote his wines. The wine was the Il Borro IGT 2000. And when I got home, I did a quick Google search only to find out that Il Borro is the project of Ferruccio Ferragamo, the son of the famous designer Salvatore Ferragamo, and his son Salvatore Ferragamo, is named after his grandfather. I took my three bottles of Il Borro and decided to save them, and over the past 15 years, I enjoyed two of them but have been saving the third and final bottle. Salvatore Ferragamo was recently in town to share his current release of wines. It had been 15 years since we first met but this time I knew exactly who I was talking to and looked forward to learning more about the winery and tasting the wines. Salvatore Ferragamo, who has the responsibility of carrying on his grandfather’s name, studied at New York University for both is undergraduate degree as well as his MBA before entering the family business. Today, he is the CEO of Il Borro, which is more than a winery. Located one hour south of Florence, near the town of Arezzo, Il Borro is a medieval village that dates to 1039. Ferruccio Ferragamo purchased the property 1993, and along with his son, Salvatore, began restoring it. As they restored the beauty of Il Borro, they focused on bringing the estate back to life. In the heart of the medieval village, there are artisan workshops including the shoemaker, the goldsmith, the decorator, the tailor and the embroiderer. The village also is home to a five-star Relais & Chateaux property with 35 suites and a few luxury villas, a spa and two restaurants. They produce olive oil, honey, vegetables, chicken, eggs and beef, in addition to wine. Certified organic since 2015, Il Borro focuses on renewable energy, the use of natural fertilizers, no pesticides and maintains a negative carbon footprint. With a location in the hills of Arezzo, outside of well-known Tuscan wine regions, Il Borro has the flexibility to be creative with their wine production. In fact, they are the first and only to produce a classic method sparkling wine in the area with the Bolle di Borro 2011 Brut Rose. Made for the first time in 2011, this wine is made from sangiovese that is harvested early. The wine spent 48 months on the yeasts, resulting in a salmon-colored wine with aromas of red fruits and a richness on the palate that makes this wine, made on a dare, a wine that you want to enjoy with different foods. The Lamelle IGT Toscana Bianca 2016 is a chardonnay made in the Chablis-style. So fresh, with bright notes of gooseberry and flowers, as well as minerality, in a blind taste, you might think this wine was a sauvignon blanc. The Polissena IGT Toscana 2013 is 100 percent sangiovese that is aged for 12 months in second and third year barrique. With aromas of dark black fruit, black olives, dried cherry, leather and spice, this wine is a traditional sangiovese. The flagship wine is the Super-Tuscan Il Borro IGT. The first vintage produced was the 1999 and recently I tried the 2012. Made with 50 percent merlot, 35 percent cabernet sauvignon, 10 percent syrah and five percent petit sirah, this powerful well-balanced wine spends 18 months in new barrique, has notes of black fruit and medium acid and soft tannins on the palate. The following night after I enjoyed dinner with Salvatore Ferragamo at Toscana Restaurant in Los Angeles, I pulled out my final bottle of the Il Borro IGT 2000 and took it to dinner with some friends. The wine was delicious. It was worth saving for 17 years. The wine was still bright and fresh with dark fruit aromas, as well as notes of leather and sweet tobacco.